Am on full swing homesick/familysick mode. Called mi familia last night, only to talk to my little brother (who's not so little anymore, btw, he's turning 17 this year!! Wow.) for 20 minutes (we've never talked on the phone that long, trust me) and him telling me my mum is working late in the end of our conversation. Pfft he's getting smarter. He was babbling about how school has started and how my mum forced him to take tuitions on weekdays AND weekends now that he's in Form 5 and how he's worried that he'd flunk out Physics, Chemistry and Add Maths. AHAHAHAHA how cute is that?! Brother : Takmau la..Kaktin kalau ajaq menakutkan. Then kissed my sister and my baby niece goodnight, called my mum's cell. Talked for about an hour on how to view her friends' profile without the other person knowing (she thinks her friends know, somehow, I don't know why), on how to make her profile visible to friends only, how to refrain random people from sending her messages. Apparently a 50-something Matsaleh (as she calls it) sent her a 'hi you are so beautiful can we become friends' message. Am worried at first, but I know my mum won't entertain strangers she doesn't know. Though it does bother me that she's getting a lot of similar accidents lately. You won't believe the stories about rich married officers I've heard, apparently 50 is the new 30 for men. Dear God, please take care of my mum and my family so they'd always be in Your protection. Amin. Btw, baby niece is getting bigger!! She was so small albeit having long runcing fingers (where did you get that from?? We all have pendek fingers ok..pfft) and now she looks so different..
Oh. My. God. Can't. Stand. This. Miss all of them so much. SOO CUTE!!! 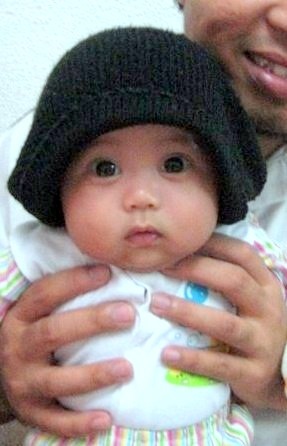 i feel like pinching her cheeks..geram!! Ya Allah comeynyaaa!! Bulat mata besar!!!!! KAN??!! TENSION OKKK -__- rinduuuu. sigh.